Dose - in medicine, a dose is simply a specific quantity of medicine to be taken at one time. In the context of vaccines, a dose of vaccine is one administration of the vaccine. Which brings us to the next term. Vaccine - a vaccine is a preventative medical treatment consisting of one or more types of viral or bacterial antigens, as well as the diluent, or vehicle. The diluent is all of the non-therapeutic "stuff" in the vaccine: water, stabilizers, adjuvants, manufacturing residuals, and so on. For example, the Hepatitis B vaccine contains HepB surface antigens, an aluminum adjuvant, the liquid vehicle, etc. for a total dose of 0.5mL. 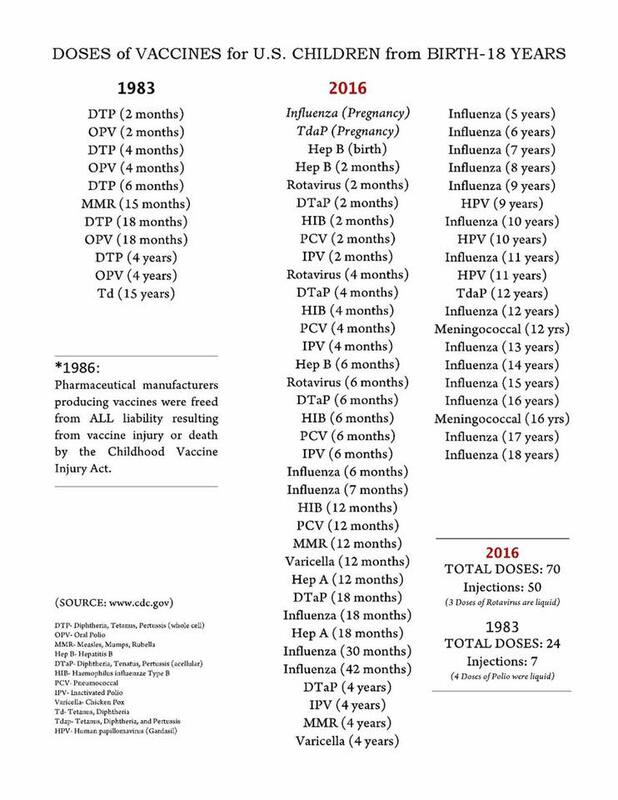 Similarly, the DTaP vaccine contains diphtheria antigens, tetanus antigens, pertussis antigens, an adjuvant, liquid vehicle, and so on for a total dose of, again, 0.5mL. One dose of vaccine means (for injected vaccines) a single injection of 0.5mL. A shot of the Hep B vaccine is one dose. A shot of the DTaP vaccine is also one dose. A shot of DTaP-HepB-IPV (diphtheria, tetanus, acellular pertussis, hepatitis B, and inactivated polio) is one dose. NVIC misleads people with this poster by stating that, for example, DTaP vaccine is actually three separate vaccines, simply because it contains antigens for three different diseases, while ignoring that fact that the total number of antigens in the schedule has gone down dramatically, as I showed in my other post. But at the same time, they note that a vaccine has all of these other allegedly "bad" ingredients. In other words, they imply that your child will get three separate injections of 0.5mL, three separate needle sticks every time they go in for their DTaP or Tdap boosters. The same thing with MMR. But as I noted in my previous post, the total number of doses of vaccines is significantly lower than NVIC would have you believe. It is even lower if one opts for combination vaccines, like the DTaP-HepB-IPV vaccine. But what's the point? Why does it matter if it's 69 doses of vaccine, 53 doses, or only 46 doses? First off, that is, at minimum, a difference of 16 injections. NVIC is inflating the number of needle sticks by anywhere from 16 to 23 shots! I am all for reducing the number of times kids need to get a shot. Getting a shot hurts. We can do things to help reduce that pain (e.g., distracting the child, getting them to relax, etc. ), but there's always going to be some discomfort. It can also be an emotionally distressing event if the child is afraid of needles. Use combination vaccines where there are safe and effective options. What NVIC is doing here is frightening parents by suggesting that their children will have more needle sticks and more trauma than they really will. The other point that I want people to get is this: the "69 doses" claim is wrong, and very easily shown to be so. Whether NVIC and the others who actively promote this claim to their followers are doing so out of simple misunderstanding or are deliberately lying in order to advance their anti-vaccine message is largely irrelevant. What matters is that they are wrong about this. And if they are wrong about something as simple as how many doses are in the vaccine schedule, what else are they wrong about? Are there other claims they make that are based on misunderstanding or outright lies? If they so easily make a mistake about the number of doses in the vaccine schedule, how much easier is it for them to be wrong about more complex issues? Thanks for staying your usual classy self, Robert, and opening with an insult. Go back and re-read the definition I provided for vaccine. A vaccine is a preparation that provides immunity against diseases by using antigenic elements of the diseases to be prevented. The preparation is not only the antigenic portions, but everything else, as well: the vehicle, adjuvants, stabilizers, etc. The DTaP is a single preparation that uses antigenic parts of diphtheria, tetanus and pertussis to confer immunity to those diseases. In the same way, the HepB vaccine is a single preparation (antigens, vehicle, adjuvant, etc.) that uses antigenic parts of the HepB virus to confer immunity to HepB. 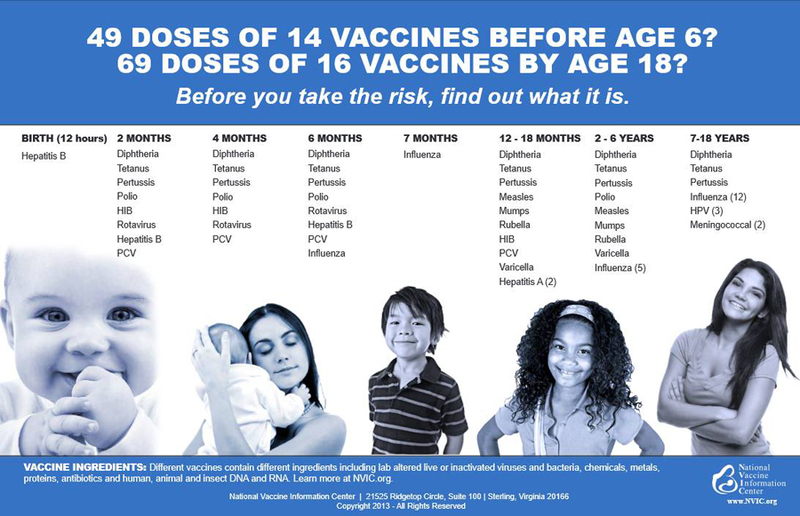 Even NVIC acknowledges this, to a degree, by including "vaccine ingredients" in their poster. Their implication is that when you get, for example, a DTaP, you're not only getting 3 separate injections, but you're getting three times the amount of vehicle, adjuvants, etc. That simply is not the case. I could keep explaining this to you, but this post and my previous one already address all of the relevant points. Read the post again, this time without your ideological blinders on. Oh, one other thing that I addressed in my previous post: if you're arguing that it's the antigen portion that is bad now, because there are more types of antigen than in the 1980s or earlier, your argument still fails because there is a significantly lower quantity of antigen in today's schedule than there was back then. Not to mention that kids are exposed to thousands of types of antigen every day, in far greater amounts than in the vaccine schedule. Robert, does Pentacel have more volume and excipients than say a monovalent HepB vaccine? Did you even know that DTaP works better as a combination vaccine than the individual antigens? Of course not and that's why you're part of the problem spreading misinformation in order to elevate yourself. When you obtain something more relevant to vaccinology than a fire science degree perhaps you'd be better equipped to discuss the issue. Random thought: how does this "too many doses" argument fit in with Wakefield's "don't combine the doses into one MMR" argument? This is why you can't reason with anti-vax. They are arguing from a position of 69 (or is it 75?) mutually contradictory beliefs. Good question. They argue against combo vaccines and instead tell people that if they are going to vaccinate, to use single-antigen vaccines, though this would greatly increase the number of needle jabs and doses of all those extra ingredients they so fear. It is a head-scratcher, to be sure. Hong Kong: 17 doses from 6 vaccine types. Too-few? Or too-many over on the other side of the pond? Please do weigh in, very interested to hear the expert$.